This week we feature a piece of content from one the absolute masters of the music. 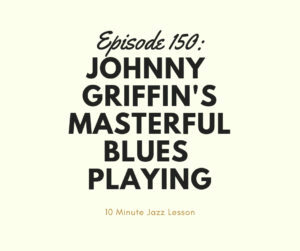 Johnny Griffin and Thelonious Monk had an amazing relationship and, in my opinion, Griffin did some of his best playing with Monk. This piece of vocabulary is from their recording from 1958: Monk In Action live at the Five Spot in New York. Johnny teaches us a couple of things in this excerpt. How to combine blues playing with bebop playing and how to use rhythm with maximum effect. Enjoy the episode!